Isserley spends much of her time driving up and down the A9 in Scotland in her old Toyota Corrolla, looking for male hitchhikers. After driving past a hitchhiker two or three times looking to see if he is well built and alone, she stops and offers them a ride. All the reader is told about this book is that Isserley picks up well-built male hitchhikers. Of course this is not something you come across every day and it did sound intriguing. Along with the words ‘macabre mystery’ on the cover, it was enough to make me want to find out more. Right from the first page I was drawn into this book which is quite possibly the strangest book I have ever read! I cannot reveal too much about the storyline as it would spoil it for the reader, however, I found it to be a very intriguing read and strangely compelling, I found myself turning the pages and read this book in two sittings. It was an easy read and probably just the right length at 296 pages. Faber has written a novel which certainly makes you think and manages to drop little hints from the start, that Isserley is not your average female. At first she comes across as quite a soulless being, but by the end of the book I had found sympathy for the character as you find out more about what she has endured in her life. As Isserley begins to question herself, and her feelings and thoughts about what she is doing, then you do find yourself feeling quite sorry for her. We follow Isserley as she picks up various hitchhikers and this was becoming slightly tiresome at one point as Isserley follows the same procedure every time. The only difference being the thoughts and conversation from the individual hitchhiker. There are some other characters in the book which are central to Isserley’s life and what she does, but revealing anything about them may spoil the story. 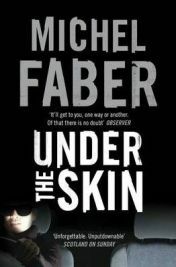 Under The Skin is indeed a difficult book to talk about without giving away the storyline. This book is certainly a macabre read and at times is quite shocking and stomach churning. I read on, wanting answers and explanations to what was going on. This is where I was left feeling somewhat let down after reaching the end. I still had some unanswered questions I wanted answering. However, I was surprised to find that I did not feel annoyed by this, as I would normally. Instead I found I was answering my own questions, which I think is the whole point. Whatever you make of this book, it is a very clever piece of writing by Faber and I am glad I have read it. Indeed, this story stays with you for quite some time after you have turned the final page. It certainly makes you think and it would be good to know other people’s thoughts after reading this also. I also have travelled up and down the A9 quite a few times and next time I spot a hitchhiker, I know my thoughts will return to this book! Thanks to Canongate Books for providing a free review copy to us. No Comments on "Under The Skin"